Corry Abellanida of Sacred Hearts congratulated teammate Kiane Dalit, left, after Dalit scored a run in the second inning. Dalit was the tourney's Most Outstanding Player. Cinderella wears black and gold this season. Sacred Hearts, a small school without a field of its own, became the newest titan in prep sports by overwhelming Kauai 5-1 last night in the title game of the DataHouse/HHSAA State Softball Division II championships at Rainbow Wahine Softball Stadium. 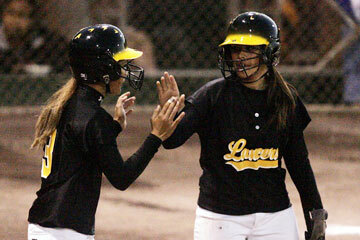 Joslyn Eugenio was a key reason why the top-seeded Lancers dominated the tourney. The sophomore threw a three-hitter, striking out three without issuing a walk. She went to three-ball counts only twice and kept the hard-hitting Red Raiders off-balance most of the night. Sacred Hearts, who smacked 10 singles out of its 11 base hits, finished the season 9-8. Kiane Dalit, a junior shortstop, went 4-for-4 and scored twice. Eugenio, who threw just 80 pitches, also went 2-for-4 and drove in a run. "They're a pleasure to work with. They made the season that much more of a joy," coach Wade Okamura said of his team, which has only one senior. "I didn't think about what this would feel like. It hasn't sunk in yet." Second-seeded Kauai closed out at 9-7. "I'm proud of them. They played hard all the way to the end," Kauai coach Darrell Borrero said. "They're still champions in my eyes. Hat's off to Sacred Hearts. They executed." Eugenio, a left-hander, was satisfied with her effort, but ecstatic about her school's first softball state crown. "During warm-ups, I was nervous, knowing that we made it to the championship game. Once we started the game, I was ready," she said. "Coach didn't seem nervous, you couldn't tell. But it's his 25th year and I know he wanted to finish strong," she said. Okamura was teary-eyed, but smiling after the epic victory. "Joslyn showed a lot of composure. She took some extra breaths, so I know she was feeling the pressure," he said. Sacred Hearts scored all of its runs in the first two innings. In the top of the first, Dalit singled and scored her team's first run on a groundout by Corry Abellanida. Taimanne Vegas, who hit 2-for-4, singled to left, bringing home Eugenio for a 2-0 Lancers' lead. Kamai, who had walked, eventually came in to score from third on a wild pitch, and Sacred Hearts had a three-run cushion entering the bottom of the first. Raecha Kauahikaua and Dalit hit back-to-back singles in the top of the second to ignite the Lancers. Eugenio followed with a single to right, bringing home Kauahikaua, and Kamai delivered a single to left, with Dalit scoring Sacred Hearts' fifth run. In the first two frames, the top four hitters in the Lancers' lineup batted 6-for-7 with a walk. Sacred Hearts managed just three hits the rest of the way, but the damage was done. Kauai avoided a shutout by scoring an unearned run in the sixth. Red Raider ace Wailana Borrero reached base on an infield error and came home on a double to left by Jessica Iwata. Other than that, it was a long night for the Red Raiders and their faithful throng of fans. "It took us some time to adjust to their hitting, on what kind of pitches to throw," Borrero said. "We knew that they were a small-ball kind of team." The Lancers had plenty of history with Kauai coming into the tourney. Sacred Hearts edged Kauai in last year's state semifinals before going on to finish second. This season, the Lancers lost to the Red Raiders in Kauai's preseason tournament 5-3. That loss, which didn't include Eugenio in the circle, taught the Lancers some valuable lessons. "That's when we learned what they're capable of. We've tried to improve as much as they did," Eugenio said. Okamura didn't want to take any chances. "The way they swing their bats, we wanted to stay away from the off-speed," he said. "Coach Wade wanted the outside pitches," catcher Chelsea Kamai said. "They were pulling all the inside ones." Eugenio went 2-0 in the tourney, allowing just one run in 16 innings over three games. "She was on. She was really on," Kamai said.